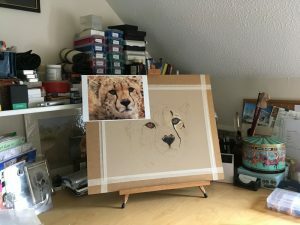 For most of my pastel paintings I use a table easel as I prefer the upright position as it gives a better perspective and allows me to easily get rid of any excess dust. For really large works I have a studio easel. But both my graphite and pen and charcoal drawings I prefer a flat surface. I have two different types of table easel a simple triangle style with a ledge to support my painting and a more substantial one with a storage compartment as the base, that also allows me to have the my painting sitting at different heights depending on the area I am painting. 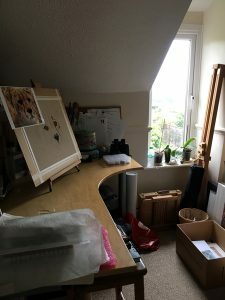 For really large paintings I use my studio easel but it does block out the light and takes up a lot of room in my studio. As you can see it is propped up against the wall by the window. This is my Studio space with one of my table easels set up with my current painting.